A job sure pays the bills, but at what price? Sitting for long periods of the day can be detrimental to your body, inside and out, but did you know that yoga can help undo the damage of your desk job? Our bodies are designed to move - in today’s modern society where computers can reign our days, we can find ourselves sitting for hours on end… and before we know it, the sun’s gone down and we’ve barely walked 5,000 steps. This is a fast-track ticket to aches, pains, tension, stress and discomfort. Eek. Will leave with you with focused concentration - always a bonus when you’ve got a hectic schedule! So let’s dive into how yoga can undo the damage of your desk job, with a little help from qualified massage therapist and yoga teacher, Rosa Lia. Heed her advice on how to stay happy and healthy in the office using yoga, and if you’re in Bristol, be sure to try one of her brilliant massage sessions. 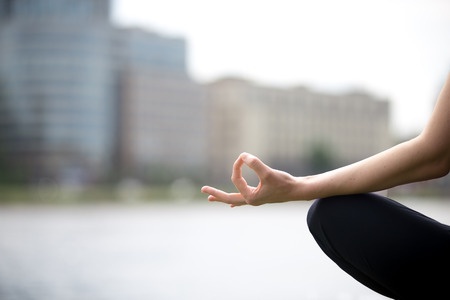 Get your coworkers involved in some simple workplace yoga or a zen lunchtime class. A benefit you’ll feel is the relief of tension in the neck, shoulders and back through gentle stretches held for a certain amount of time. Our bodies are very affected by the small ways in which we use them daily, and these areas commonly gather tensions from sitting at desks. Imbalanced muscle use means that some areas become tight, while others lose tone. All of this can mean that we overuse the muscles in the front of our body and underuse the muscles in the back. Problems in the lower back probably relate to other areas. Working on strong core muscles can help, as can having good posture. Find out more on back pain here. Lie on your back and bend your legs, with your feet close to your bum. Try interlocking your fingers behind your back and squeezing your shoulder blades together, opening your chest, as you raise your hips up to the ceiling. Work those glutes! If you have more space, you can inhale to raise your arms up and over your head, exhaling as they lower, and then reach out to the sides, palms facing forwards, drawing your shoulder blades together. If you can’t nab a meeting room for some stretches and can’t make your usual lunchtime class, look up some yoga to do at your desk. Be aware of your body whilst sitting, as each part of your body is connected to the rest. Your tight neck might be a result of jaw tension so be aware if you’re clenching your jaw. Simple neck stretches can be done at your desk - bringing your ear to your shoulder, taking a few deep breaths, then changing sides can help dissipate that building tension. Read more: Don’t forget how you can fit in exercise around your schedule to shake up your desk days. Sitting day in, day out, can cause your hip flexors to become shorter. When most of the day is spent sitting (in the office, in the car, on a bike, on the sofa) the muscles in the hips become shortened and they lose their full range of motion. Being active helps keep them flexible! Try the Thomas Test to see how tight your hip flexors are. Flexible hip flexors are important because they keep our bodies aligned. Hips link the lower and upper parts of your body. Hip flexors are our centre. Tension in other areas might actually start from here: If your hip flexors are tight, they pull your pelvis forward, which can put strain on your lower back. Imbalances in alignment can affect your whole body. Benefits of yoga for office workers include stretching out the hips and avoiding problems later in life. When in the office, do desk yoga by sitting on your chair in a cross-legged position - this will help stretch the flexors and allow for more openness in your hips. When at home, try spending time sat on the floor when reading, watching TV, or even eating. A low squat position is helpful for releasing your lower back, opening your hips, and balancing the pelvic floor. If your heels don’t touch the ground, you can place a cushion or rolled up blanket underneath. Another great hip-opener to do at home, is the Butterfly Pose. Start by sitting and bring the soles of your feet together in front of you, knees bent open to the sides. You can stay upright or fold forwards. Holding this pose for longer (start with a minute or two and build up) allows it to work deeper layers than your muscles, restoring health to connective tissues. Sitting can be a killer to the body, but the staring at the computer screen or your phone’s screen (which we’re all guilty of) can also be a strain! Your eyes can get tired looking at a screen all day. It doesn’t use the full range of motion and you can strain the ciliary muscles, which tense as you look at close objects. Rest these muscles by looking into the distance. If you have a window, relax your eyes by gazing into the distance. If you can’t do it at work, try to find a place where you can do this regularly. Regularly take breaks from the screen to relax the eyes! Bring your thumb into the centre of your gaze. Focus on your thumb, then switch your gaze to the distance (or a far object), then refocus on your thumb. Look as far as you can to the left and the right, then as far as you can up and down. Really feel the small muscles around your eyes flex as you do this. An instantly soothing yogic trick is to rub the palms of your hands together fast until you build up heat, then place your palms gently over your eyes. The dark and warmth are restful and you may also feel a tingling sensation, energizing your eyes. See more yoga eye exercises if you’re really feeling the strain! 4. Use yoga to lower work stress levels! There’s no way to stop stress from occurring unless you throw your laptop in the air and quit on those particularly hard days, but regular yoga can help alleviate it before you hit breaking point. Stress is a whole body response to a situation so can have a huge impact if you don’t keep it in check. Modern lifestyles often overstimulate the stress response which can affect your digestion, immune system and even your ability to trust. Not ideal. Closing your eyes lets your body know you are safe and removes stimulation, allowing your mind to still. Deep breathing allows your body to bring in what it needs and release what it doesn’t. You bring in oxygen and release carbon dioxide. Visualize breathing in energy or peacefulness, and breathing out tension. As you spend more time focusing on your breath, you will begin to feel peace through your whole body. Deep breathing flows through you, expanding and contracting. It feels like a massage, working its way through your whole body and mind. Read more: And don’t forget more of our tips on how to relieve stress and avoid taking your work stresses home! You don’t always have to attend a candle lit yoga session and spend hours finding your inner peace to relieve the aches and pains from sitting at a desk all day. You can do subtle exercises at your desk and simple stretches to combat the stiffness and stress that build up. With a little more awareness about how your routine affects you, you can really take ownership over your body and health. Try some of these yoga techniques to undo the damage of your desk job, but remember, the point isn’t to beat yourself up over what you should be doing. It’s about being aware of what’s impacting your body and how you can improve your body and mind with the tools available. Visit qualified massage therapist and yoga teacher, Rosa Lia, and experience one of her brilliant massage sessions in Bedminster, Bristol.